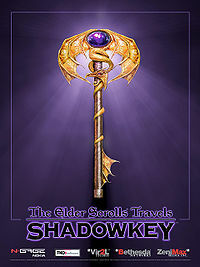 The Elder Scrolls Travels: Shadowkey is a portable spin-off game in the TES Travels series. It is available only on the Nokia N-Gage. "War comes to Hammerfell, danger and ambition consuming three kingdoms. But some dangers arrive not upon studded boot, but move in stealth among the shadows. For a war of magics roils in the shadows, mixing with, and as dangerous as the war fought with steel. But unknown to kings and High Mages, the flames of war will forge a hero. It is this hero's destiny to alter theirs, and change the world of... Shadowkey." Attributes — What are your basic stats? Races — An Argonian in the ice of the north? It can be done. This page was last modified on 17 February 2019, at 05:27.